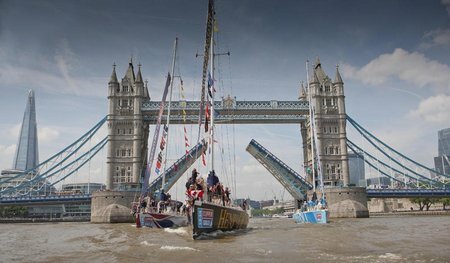 Fresh from her epic Clipper 2013-14 Round the World Yacht Race, Henri Lloyd 50 years of Pioneering Spirit will be sailing in Cowes next week. The black and gold livery of the winning yacht will be seen in the Solent from Tuesday 5th to Friday 8th August hosting guests of Henri Lloyd for a rather more gentle sailing experience than her recent 40,000 mile voyage across the world’s oceans. Henri Lloyd shall also be staging an exhibition at the Sir Max Aitken Museum in Cowes High Street during the week, showcasing some of the product innovations from the company’s 50 year history including the Henri Lloyd oilies as worn by winning Clipper skipper Eric Holden. Henri Lloyd 50 Years of Pioneering Spirit was skipper by Canadian meteorologist Eric Holden. Each leg was manned by a crew of up to 24 people. Ten of the crew members sailed the entire round the world voyage and a further 42 members switched between the legs to complete the crew. Henri Lloyd’s crew was comprised of amateur sailors predominantly from the UK, US, Canada and Italy. The youngest crew member to sail aboard Henri Lloyd was 20 year old Jonathan Morris from Italy and the oldest was American Sam Hagler aged 73.